Expanding its collaboration in its second year running, INTI and ZALORA gave ten students from INTI International College Subang’s (INTI) fashion design programme the opportunity to step out of the ordinary fashion trends and embark on a challenge to design Muslimah wear. Riding on the booming Islamic-inspired fashion market in Southeast Asia and with an already established line called ‘Zalia’ on ZALORA’s online platform, the competition focused on exposing budding fashion designers to the world of Muslimah fashion. 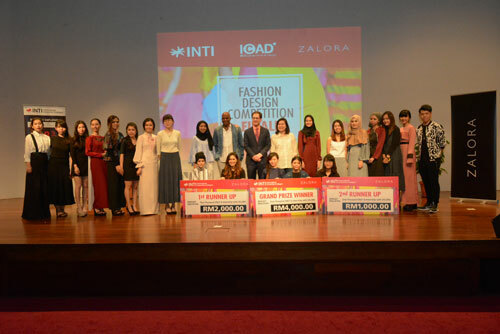 The winners, participants and judges, including Nina Aziz, Fashion Buyer from ZALORA Malaysia (9th from left, second row); Timothy Johnson, Senior Vice President for Marketing, Products & Partnerships, INTI; Tim Bulow, CEO of INTI; and Ang Tong Yin, Dean for INTI’s Centre for Art and Design. From understanding the concept behind Muslimah wear to researching current trends and looks, the students took up the daunting task of turning simplicity into elegance and glamor while maintaining the key aspect of Muslimah wear– modesty. Beyond the fashion aspect of the competition, it was also an education on Islamic culture, modesty and its evolution over the years. In achieving their desired looks, the students worked together with INTI’s fashion design lecturers and ZALORA representatives to develop concepts and received advice on what would work for today’s Muslim women. From a class of 15 students participating in the preliminary round, the group was then narrowed down to the top 10 finalists who were selected based on their concept, design and understanding of Muslimah fashion. The top ten fashion designers were each given RM300 to turn their design sketches into wearable clothing which was displayed at the competition finale runway. As part of the final runway, the competition also saw the collaboration of independent makeup artists and hairstylists Cindy Hor, Lui, Wilson Tan and Sherry Wong who sponsored the styling for the final ten designers’ model’s looks. “This was a first for our students in creating Muslimah fashion but I’m proud that the top ten finalists took up the challenge and executed their designs well. 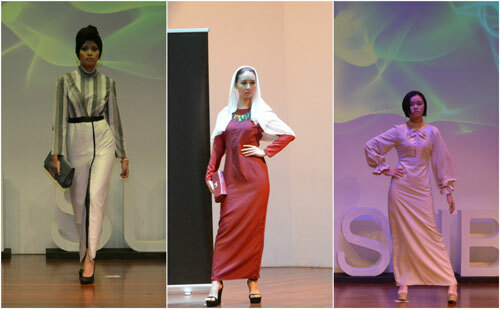 With all the finalists being non-Muslim, it was interesting for them to learn a new culture and a new fashion concept. It was also insightful for the judges to see how the finalists made their designs fashion forward and trendy without compromising the critical elements of the Islamic-inspired fashion,” shared Ang Tong Yin, Dean for INTI’s Centre for Art and Design and fellow judge of the final runway of this year’s INTIxZALORA Fashion Design Competition. Apart from producing their design for the final runway, the competition also called for the ten finalists to present the concept behind their garment and share a marketing plan to the judges on how they wish to market and sell their creation. From elaborate back stories to their design concepts to clear cut marketing plans, the students impressed the panel of judges consisting of INTI and ZALORA representatives in a bid to be named champion of the competition, which comes with a cash prize of RM4,000, an internship with ZALORA, a personal photo session and the tremendous opportunity to sell their garment on ZALORA’s online platform. A collage of the designs showcased during the INTIxZALORA competition. “What was interesting with some of these finalists’ designs was the fact that it transcended beyond the Muslim women market. They were creative and visionary to see how women in general, not just Muslim women, would feel fashionable and comfortable wearing their design. This was a great exposure for students to get a feel of the progressive nature of the fashion industry where cultural influences are trending and you see trends like Islamic-inspired wear slowly making a presence in mainstream fashion,” shared Nina Aziz, Fashion Buyer from ZALORA Malaysia for the Traditional Wear category and fellow judges from the competition. This year’s INTIxZALORA Fashion Design Competition winner, Tang Wai Ping, aged 19 and a final year fashion design student, was inspired by the beauty of the night sky and moonlight. Drawing from that inspiration, she created an in-trend minimalistic look in the form of a satin and lycra midnight blue floor length dress. The highlights of the midnight blue lycra which sparkled in specific parts of the dress showcased Wai Ping’s clear thought process in her design and execution. Going with a minimalistic design gives Wai Ping’s target market of women between the ages of 20 and 30 the choice to accessorize with different statement pieces, allowing creative expression of the dress in different ways. Her clear articulation of her design, convincing marketing plan and her ability to take on the judges’ questions won her the grand prize. Fellow finalists, Chloe Annmarie Manuel and Wong Chin Chee, also aged 19, came in second and third place respectively for their interesting designs and inspirations. INTI collaborates with top brands and organizations in providing students opportunities to enhance their skills and talents while working alongside potential employers in an effort to develop their portfolio. These initiatives give students the necessary industry experiences needed while still studying to further enhance their soft skills which are communication, collaboration, creative and critical thinking. INTI’s strong industry linkage with over 400 companies has resulted in 98% of INTI graduates being employed within six months of graduation with 82% earning incomes higher than the market average and 25% of graduates receiving job offers even before they graduate as validated by BDO Governance Advisory.